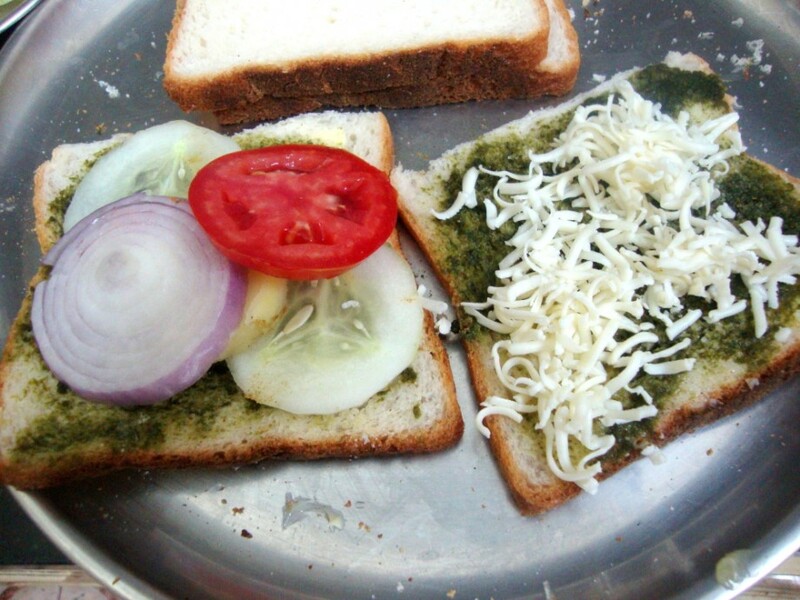 Ever since seeing these sandwiches in Bombay which was really way back in college days, I have been obsessed with the famous Bombay Sandwiches that are offered. If I am right almost a year ago I was looking at various books and reading on sandwiches when I remembered this sandwich. So I had to read on this. I have been wanting to make this since then. Coming back from office, I made sure I got other things that is required for making another chat but only after getting back home, I realized that I forgot to buy the main ingredient. My plan was to make both the dishes today but finally settled to make just these sandwiches. Between I was so happy to hear Amma saying they enjoyed Dahi Samosa Chat and were expecting me to make it again. Well what more can I ask for! 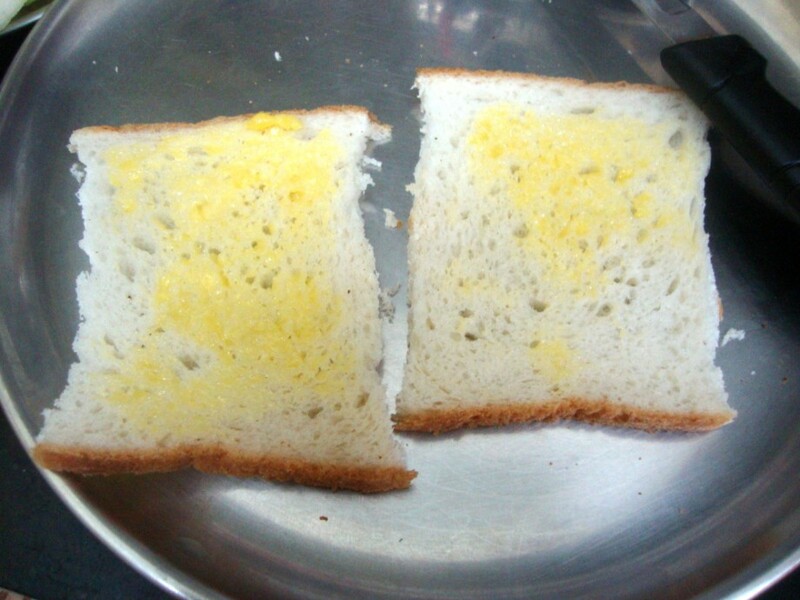 I told her that I was going to make these Bombay Sandwich and she better not complete her dinner before I can make these. I made both the plain ones and grilled sandwiches. Both were excellent. I couldn’t decide which was more delicious, of course the grilled ones were out of the world and you really ought to trust me on that! These fresh ones got soggy, well my Green Chutney was little runny and I didn’t get time to drain them. Still yummy! 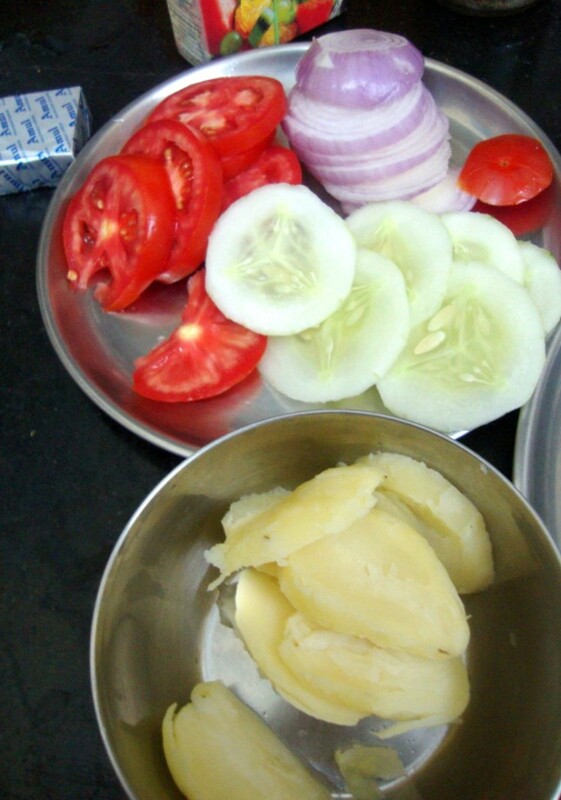 Cucumber slices, Onions, Tomatoes and Boiled Potatoes. Well I had even Beets but that was going little far I know! Grated Cheese for the grilled Version. Trim the sides, butter the slices. Now don’t ask me where the Green chutney bowl. I seem to have forgotten to click that alone. anyway you see the green chutney being spread over the butter. Next goes Cucumber slices, Onions, Tomatoes, Potatoes and you press the other slice over this. Actually they even make it three slices, well I wanted to get this done fast! Finally sprinkle the cheese over the slice and flip it over the other. Well this way your cheese will fall down, best was sprinkling over the other slice. 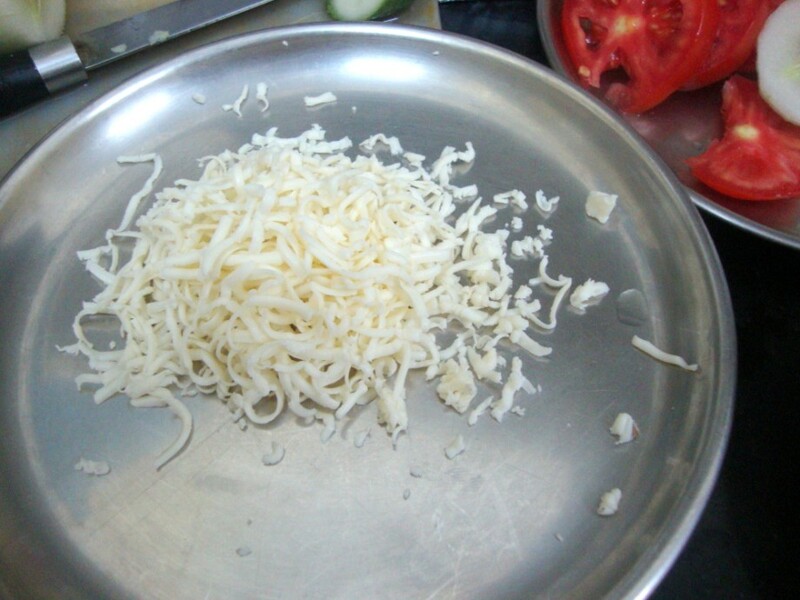 Grated Cheese for Grilled version. 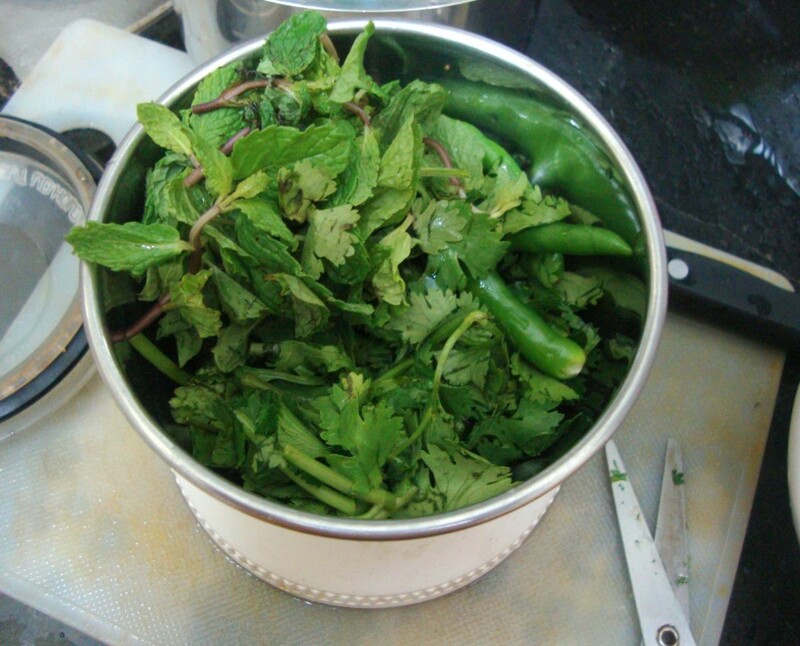 Wash and chop the coriander and mint leaves. In a mixer take the leaves along with green chilies, salt. make it into a smooth paste. Try not to add too much of water. Peel and finely slice the vegetables into thin slices. Trim the bread on all sides if required. 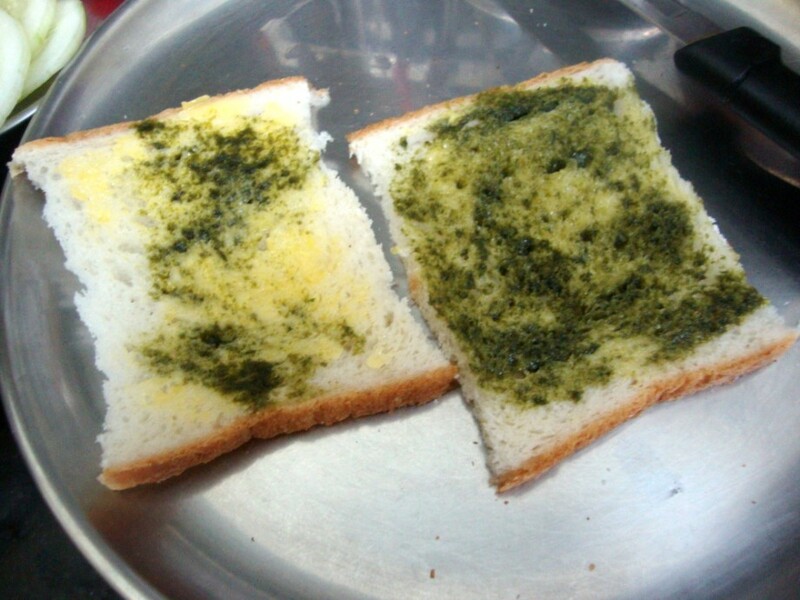 Apply butter on a bread, then apply the green chutney all over. Then place the other slice over one and cut into bite size. Once you are done with placing the sandwich, spread the grated cheese over it. I grilled my sandwich in my sandwich maker and it turned out superb. Hubby dear was very enthusiastic seeing me do something new. There are some famous Sandwich shops that we know and he said I look like how they make. After tasting he agreed these were best. Konda loved it so much that she insisted I make some more for her. So it was really a fantastic experience making this at home. Will surely be making this again. I have never eaten any street food except for some chaat. This looks great. What more do we need when the kids ask for seconds and more!! Grilled sandwiches do look delicious! Like the first picture where the charred onion is falling off the sandwich. love the sand witch,loved the green chutney flavor…Thanks for the event,I stated cooking many new dishes and appreciation from my silent hubby too…. 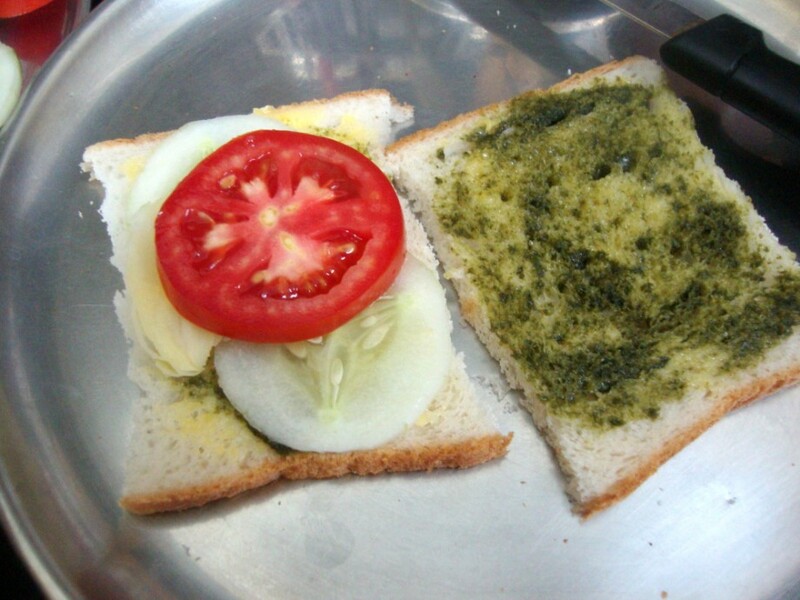 Yum….I love Mumbai sandwiches too…Mind you I found the green chutney they had used too hot!! Seriously everytime i come here u r just killing me with ur chaats,needless to say am hungry rite now,irresistible sandwich.. 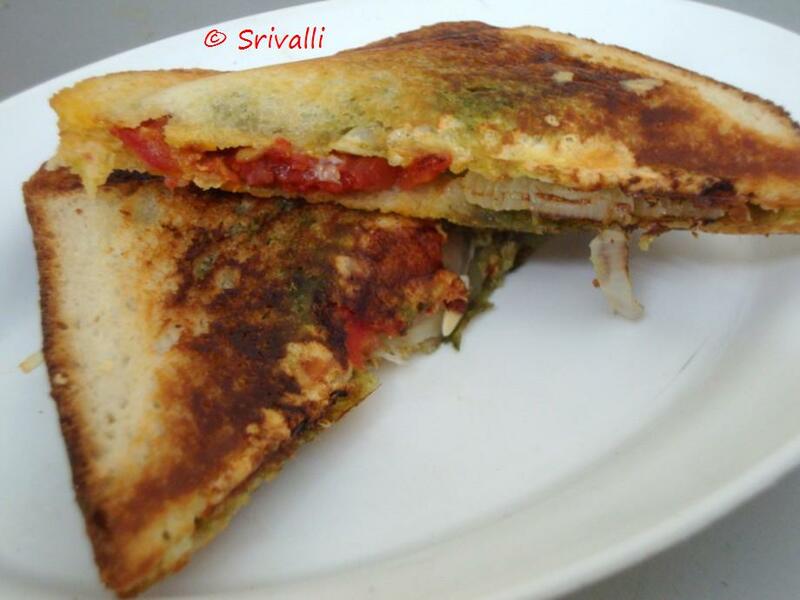 The sandwich looks so tempting and mouthwatering srivalli. Just awesome!!! 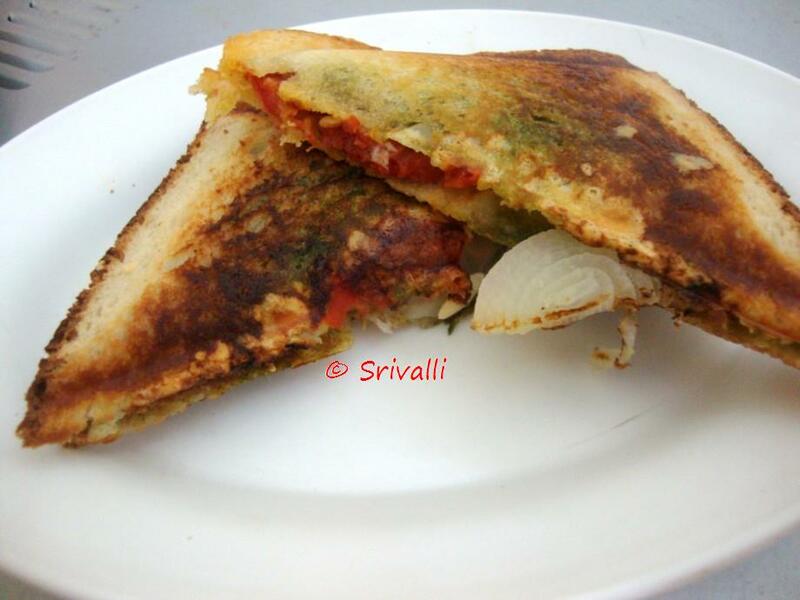 this is too tempting..should make it soon..
this is what I called movie theater sandwich!….I blogged about it sometime back..love the grilling idea…I am going to try it! I love the grilled version.Looks so inviting! The grilled version looks so good, Valli. They sell this on the streets in Egmore….tastes absolutely wonderful. 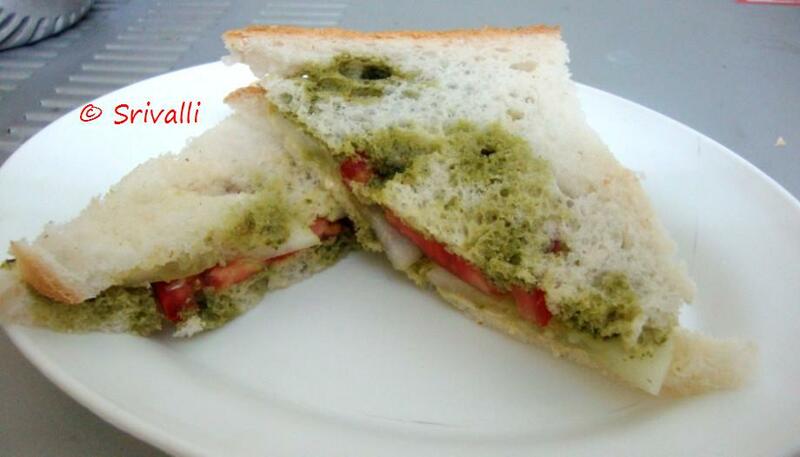 Wow I liked that spicy delicious and crisp looking sandwich nice recipe valli. love the sandwich and you seem be adding so many dishes to your chat dishes!!!!!!! Thank you friends..I am so glad you liked this..